You’re entering a 20 billion dollar per year industry that includes many careers. Think about it, the majority of women (and men) go to the salon a few times per year, if not a few times per month, to get all sorts of beauty procedures done. Even during hard times, women still pay to keep up their color, cut, and highlights. You’re entering an industry that laughs in the face of recessions! But now that you have your certification and license, are you wondering what comes next? Well, there’s a lot out there for you to know, and we’ve got it all right here. Especially in the beginning, your career will grow as much as you are interactive and proactive. After you walk out the front door of your school, and ace that certification exam, it’s going to be up to you to grow your clientele list. Sure, wherever you end up working may be nice and help you with that, but not all salons do. You need to go in with zero expectation from anyone but your little self. You can read some expert advice, and follow some of these tips toward a fruitfully successful cosmetology career. Keep growing your online portfolio. You may have started one while you were in school. Don’t neglect it; this is a major component for showing others what you’re capable of. Plus, it’s cool to be able to measure your progress along the way. Find yourself an awesome mentor. Work alongside that person as his or her assistant. The skills you can pick up that way, from technique to customer relations, are priceless! Don’t stop learning. New trends are constant, especially because of social media. Hit all the educational shows and events you humanly can, so you can learn how to do all the latest trends. Practice makes perfect. Practice on everyone—maybe even your dog. It helps to refine and advance your skills, keeping you fresh, fast, and fantastic. Don’t be flighty. Find a salon that matches your personality and stay there for a while. The more you move around, the harder it is to keep consistent clients. And that’s really what it’s about, having a solid base of people coming to you, and then spreading the good word around. Market yourself. After all, you’re in the market for clients, right? Have cute cards made and pass them around to everyone. Seriously, EVERY. ONE. What’s the worst thing that can happen, aside from quickly running out of cards? Wait, don’t answer that. But, say for every 100 cards you pass out, you get 1-2% to come in for a service? They love what you’ve done to them and tell their friends, and so on. Upselling is okay. Perhaps your client came in thinking only about a haircut, but because you gently suggested another service such as an eyebrow arch, you put another few tip dollars in your drawer. Keep a client dossier. Send them cards for special occasions, maybe with a discount coupon as a gift, or a free service. Make them feel special and important. It’s those little extras that create customer loyalty. Do some good. Donate your services for fundraisers, events, or charity. There’s nothing more beautiful than helping someone who has faced cancer or a tough situation feel special and put together. Know your way around a salon! As to be expected, Facebook is the No.1 social media platform in the world, with Instagram not falling all that far behind. Coincidentally, those two are perfect for you to use to grow your cosmetology client list and reputation (so keep it professional on your brand pages). Out of the 214 million or so active Facebook users in the United States, you’re bound to wow a small percentage of them with your cos skills. And Instagram, with its over 400 million users, has captured the hearts of more than 40% of social media users. You NEED to be there promoting yourself, or you’re missing out on potential opportunities. How To Use Facebook: Facebook is the number one social platform, and it's important that you have a presence there. Create a FB business page. It’s free and easy to set up. Use your own name and create the page as a local business. Once you have your page set up, create a few posts first so that once you start inviting people to it, they’ll have something to see. Use Facebook similarly to Instagram, minus the hashtags. Here as well, you can announce where you’ll be working, your hours, your openings, and anything else relating to your business. ALWAYS stay professional on your business pages. How To Use Instagram: Instagram is THE place to become instafamous. But you need to know how to properly use this tool to benefit your career growth. Participate in popular hashtags like #cosmetology, #hair, #mua, #makeup, #skincare, and #nails. It’s easy to find relevant hashtags using Instagram’s search tool. Always take a picture and post your best work, appropriately hashtagging in the first comment. Do product feature posts giving away a couple of your “trade secrets”; it establishes trust. Respond to comments. Always. Keep those conversations alive and well. Do an Insta-promotion. For example: New clients receive a particular discount or additional service for mentioning they followed you on Instagram. YouTube is perfect for video content like tutorials and product reviews, which can also be shared directly to Facebook. You may even want to start your own blog where you can put tutorials and all things career related. There are a couple different free platforms—Wordpress and Blogger. Also, don’t discredit Twitter. Like Instagram, it can be a great place to connect with all the brands you love. Yay you, you’ve graduated from your cosmetology school AND passed the exam! You’re ready to go out into the world and change lives, one cos service at a time. Really, finding a job in your chosen profession is no different for any type of career. You have to have an idea about what you’re looking for, what it is you have to offer, and what part of the industry you want to focus on. Aside from tidying up your resume and perfecting your portfolio, there are a few other things that can help you. Job placement: Many beauty schools offer job placement services. Utilize them, that’s what they are there for. Apply yourself: There are a kagillion salons on every street corner. Visit them, take a look around, and notice whether or not you could see yourself working there. If yes, then fill out an application. The Internet: Websites such as Indeed.com, LinkedIn, CareerBuilder, and Craigslist have extensive job postings. It’s not a bad idea to spend some time checking those out. Network: Find out about local networking events, grab your cards and maybe a friend or two, and go! Make a list: Once you’ve done your due diligence, researching all the salons in the area you want to work at, make a list of the ones you are applying to. It’s just easier when you’re organized. Rent or buy: Decide if you want to rent a chair or if you want to be a full-on employee. Salons all do it differently, and you should know before you go. Your digital footprint: It’s a well-known fact that employers Google search their prospective employees. You want to have your online presence as clean and professional as possible. That may mean a little hiding and deleting of posts and images. Or maybe not, if you’ve already kept a tame online life. The interview: Once you’ve gotten interviews lined up, make sure you’re prepared with your resume, portfolio, and a dazzling smile that exudes confidence. And dress for success! You could be the greatest hair stylist since Vidal Sassoon, but if you’re lacking in other key qualities, you may have a difficult time landing a chair in any salon. There are certain aspects that salon owners look for in their stylists, beyond what you learned in school. There will be a lot of competition for the available jobs, especially in the more popular salons. Knowing what the hiring personnel are looking for can help give you a leg up. People person: This is sort of an important quality, because you’ll be working with people, and on people, all day long. So, you sort of need to have this quality. Problem solver: Stuff happens: color crises, haphazard haircuts, and so many other potential cosmetologist catastrophes. Are you a quick thinker, capable of turning a bad situation into a happy ending? Direction follower: Pay attention and listen—don’t just hear. For example, when the salon owner gives you the application and asks you to completely fill it out, they will see if you did just that. If you didn’t, don’t expect an interview. The same goes for all of their requests, all throughout your career. Values: Salons are going to want to make sure that your values align with their core identity, so when you’re going through your list, it’s important to research their online sites as well as visit the physical store to see if it’s a good match for you. There are really no set-in-stone continuing education rules for cosmetology; each state has its own rules. However. And that’s a giant, ALL CAPS HOWEVER. Trends change more rapidly now, and to keep up with them, you’ll need to be schooled. 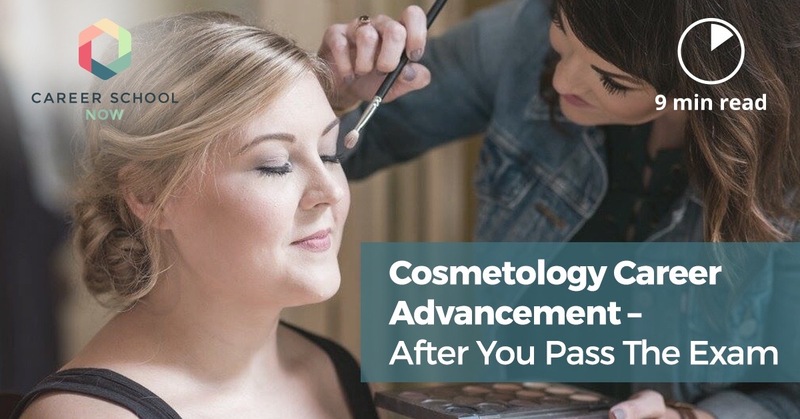 It’s so important, if you want to be a successful cosmetologist, to know how to do all the things your clientele are finding on social channels and blogs. You definitely don’t want to give someone else one of your clients simply because you hadn’t learned how to do balayage or mermaid hair. Not to mention, you need to stay updated on sanitation, client satisfaction, and safety standards. Continuing education doesn’t mean going back to school. It merely means that you need to be watching YouTube videos, attending seminars, working with mentors, and attending workshops. Do anything and everything you can to stay up to date with the constantly changing trends, as well as perfecting your already established skills. If you know how to do pretty much everything, you make yourself exceptionally marketable, as well as desirable, to clients. There are some different and unusual paths you can go down when you have your cosmetology license and some related experience. Maybe you don’t love the idea of being restricted to a salon, or perhaps you feel there is something that lies beyond, which you just aren’t aware of at the moment. With your cosmetology certificate, you can become a fashion stylist, artistic director, beauty writer, mortuary makeup artist, special effects makeup artist, and so much more. You may even come up with your own outside-the-box cosmetic career! You can also choose to specialize in areas like color, nail artistry, skincare, and many other areas of cos. If you can dream it, you can do it! Exciting and unique cosmetology careers.